Drop by between 10am and 3pm to join our big challenge. Can you navigate your way round the farm using only a compass and a map? £1 per child. Can you face our farming challenges—cow milking, welly throwing and egg and spoon races. Will you be the winner? Contests start at 11am, 12pm, 2pm and 3pm. Meet at the bottom of the farm yard. FREE. Summer Activities for over 8’s. Are you wild about the different wildlife on the farm, and love searching for different animals around you. 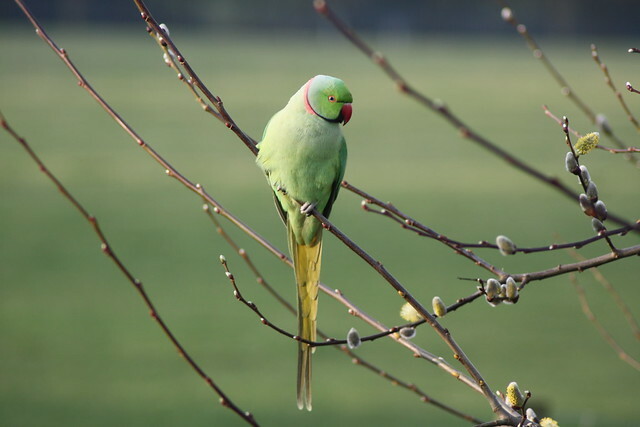 Then join us for a day of wildlife surveys and see what you can find. Sessions from 10am-12pm and 2pm-4pm. £2 per child. Booking is essential, call 0208 319 8900. Parking is limited, please use public transport where possible. If you visit the farm, there are some more new arrivals to see – some Irish Moiled cattle – “one of our rarest and most distinctive native cattle breeds”. One of them is in calf – due any day. 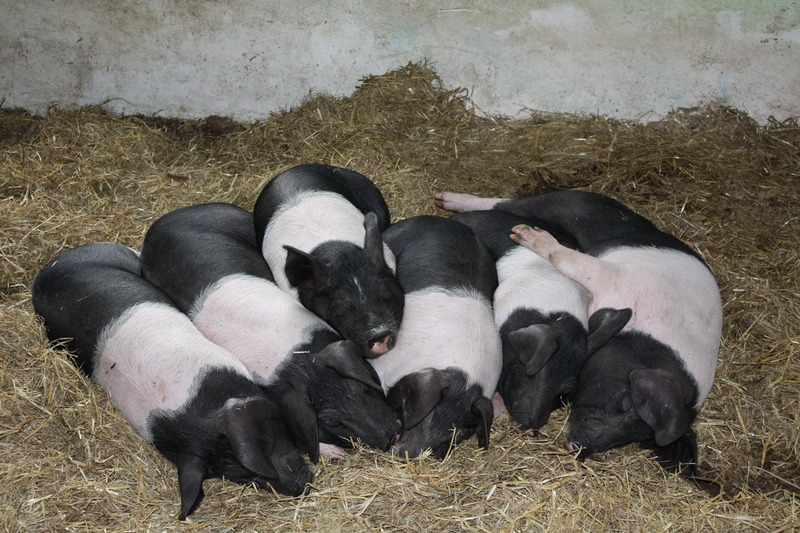 I haven’t got any pictures of them (yet), but here are the Saddleback piglets in training for the Olympic synchronised sleeping event. What Next for Eaglesfield Pond? This summer’s record-breaking rainfall has had at least one benefit – The Eaglesfield Park Lilly Pond is thriving. The wild flower meadow around the pond, planted by volunteers earlier in the year, has grown tall and the Lilly plants in the pond seem to be well established, though no sign of flowers (yet). Following on from the official opening of the restored pond we received a lot of comments from people indicating they would like to become involved in the future development of the pond and surrounding wildflower meadow. 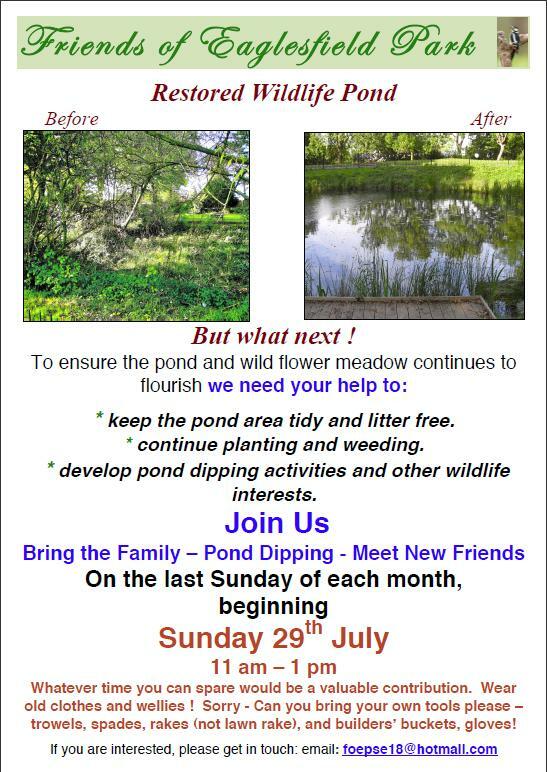 We will obviously be talking to the appropriate Council Departments regarding continued maintenance of the area, but to begin the process and to maintain the interest of local residents and park visitors we would like to propose regular “tidy up and pond dipping sessions” on the last Sunday of the month between 11.00 am and 1.00 pm (weather permitting!). Due to the wet weather in Spring, we were unable to seed about a third of the meadow area and we will catch up with this at a later date. The remainder of the meadow that was seeded has had varying degrees of success and will need to have invasive “weeds” reduced. The pond may well require “blanket weed” management and, of course, generally I am sure we will always have to combat litter and debris. We would also like to ensure that pond dipping activities are accessible to as many children (and adults) as possible and look forward to receiving suggestions as to how this could be achieved. We hope that by meeting regularly we hope to ensure more people will be able to enjoy this wonderful new focal point within the park, and that it will also provide an opportunity to meet other park visitors and to receive their comments and suggestions. Hopefully the weather will be dry and sunny on the 29th, unlike the recent heavy rain – captured in the latest photograph for the Flickr set showing the changing pond. * Friday 20th July – The ‘Midnight Megawalk’. 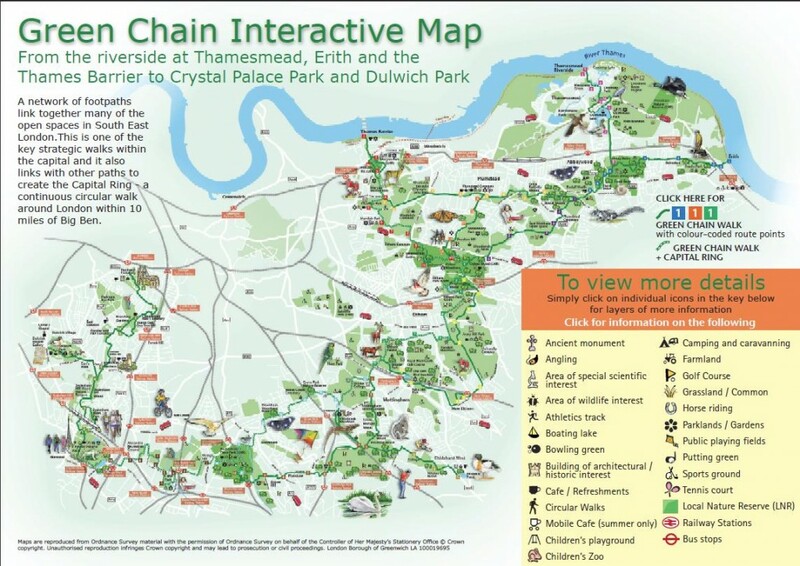 A very leisurely 22 mile stroll over the most popular sections of the Green Chain Walk from Crystal Palace to Erith, but with a difference, the walk is nocturnal! Meet outside Crystal Palace railway station at 22.30pm. After the first five miles we enter woodland for a pitch black stroll. Quite amazing! By the time we get to Eltham we’ll see wonderful views of London at first-light. This was so good last year that we spent about 20 minutes watching. At 05.00, after much more dark woodland we arrive at Shooters Hill for sunrise, and there’s no where better to see it as the view extends right over Essex and the estuary. The rest of the walk is almost entirely in woodland and I assure you, it does look lovely at that time of the morning. We arrive at Erith and the Thames at about 07.30 for plenty of trains home. Ian is also organising the seventh daylight version of the walk for Saturday 29th September and will send more details when they are available. 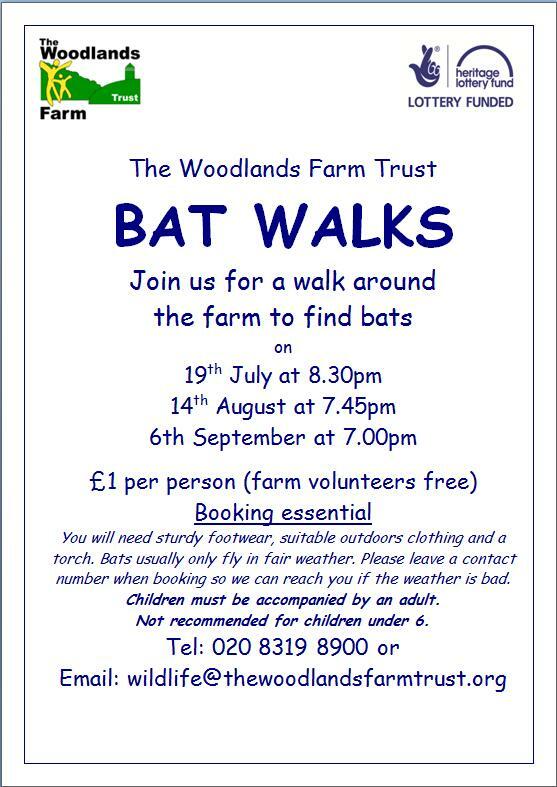 Another opportunity for bat enthusiasts, following the successful Shrewsbury Park bat walk, Woodlands Farm are holding a series of bat walks over the next few months, part of their recently launched Heritage Lottery Funded Farm Conservation project. The Sunset Survey couldn’t be easier! Simply spend the evening in your garden and watch out for any bats that fly past. Record how many bats you see, which species they are (if you think you know) and, most importantly, which direction they are flying from. The Sunrise Survey involves going out just before dawn to look for bats swarming before they return to their roost. If you have already done the Sunset Survey and saw bats flying past, you should walk in the direction from which most of them seemed to be coming. This survey is aimed at beginners and is an excellent way of contributing to the monitoring programme if you don’t have any previous experience of bat surveying. I’ve heard that one of the bat species that can be seen at Woodlands Farm is the Daubenton’s Bat, which hunts its insect prey over the ponds there. So here, to whet your appetite for bat viewing, is a fascinating clip from Springwatch of Simon King filming Daubenton’s Bats hunting. I see work has started on the restoration of the grade II listed St George’s Garrison Church, another “Heritage at Risk” building close to the Olympics shooting and archery venue. Hopefully this will result in more people being able to see its marvellous mosaics. The organisation responsible for the restoration, Heritage of London Trust Operations, aims to make the church suitable for use as a small scale venue for appropriate events. It “intends to run occasional events at the chapel that will cater for fifty to a hundred people” as well as to provide access for “formal and informal educational visits”. A local friends group of volunteers will be established to help co-ordinate the running of the venue. The first step of the work, currently underway, is to convert two rooms near the entrance to the chapel into a kitchen and toilet, but the major change is to construct a new cover for the apse, which is where the memorial mosaics are located together with the marble tablets listing the names of Royal Artillery soldiers who were awarded the VC and the war in which they won it. 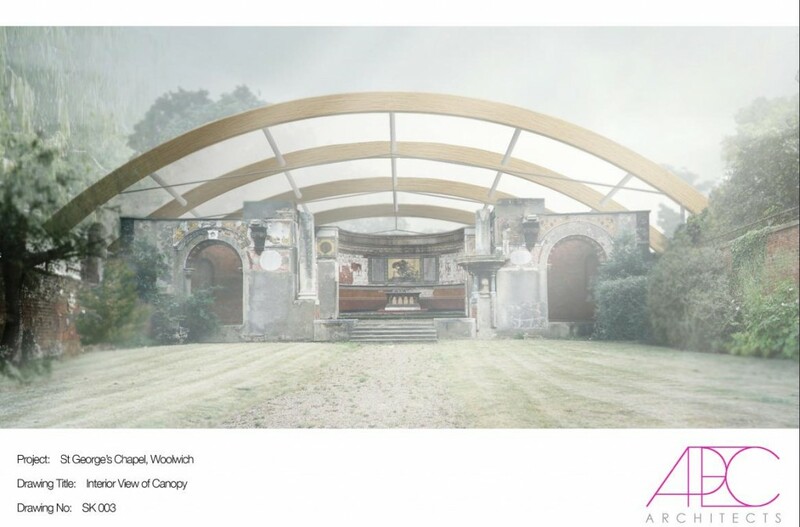 APEC Architects, who prepared the planning documents, considered various options for the new canopy but the final decision was for a free-standing glulam timber-framed arch with a tensile fabric covering as envisioned in the picture below. Proposal: Remove the damaged roof as it is no longer required. Repairs to brickwork at the top of the walls to be carried out as required. 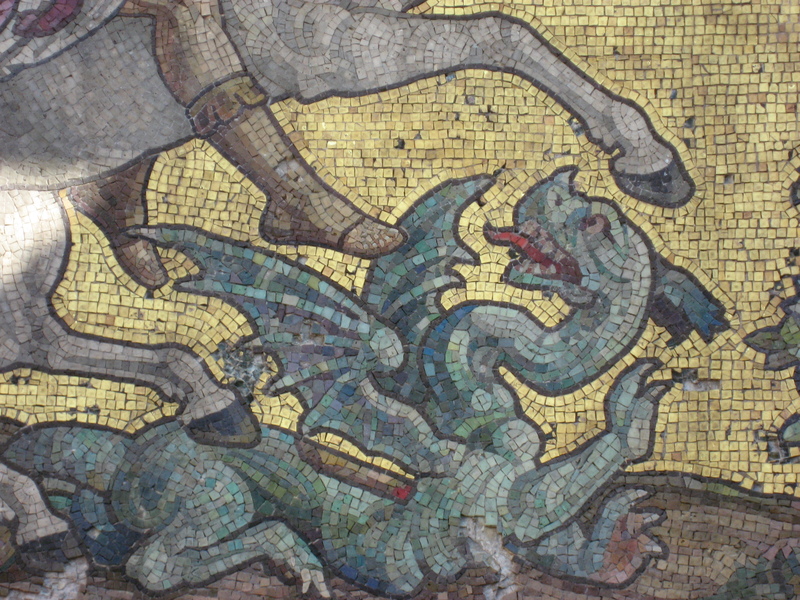 Proposal: Mosaics to be fully restored by appropriate specialist. Remnants of glazed roof structure to be removed and brickwork repaired as appropriate. 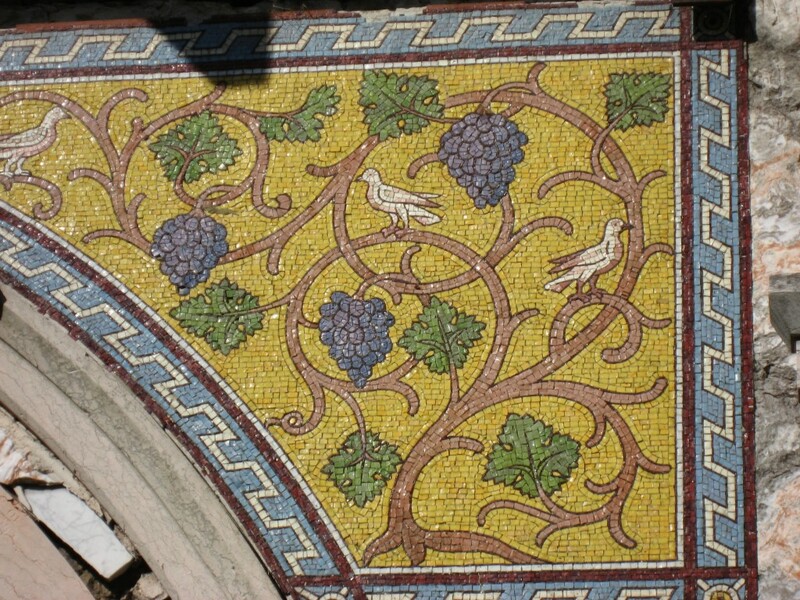 Proposal: Mosaics to be fully restored by appropriate specialist. Damaged brickwork to be repaired. Proposal:All gates to be removed for X-ray inspection. Any defects are to be repaired before the gates are reinstated. Proposal:The bricked up access to the undercroft space is to be opened up to provide a space for storage. A timber plank door, within a timber frame, is to be installed within the arch. 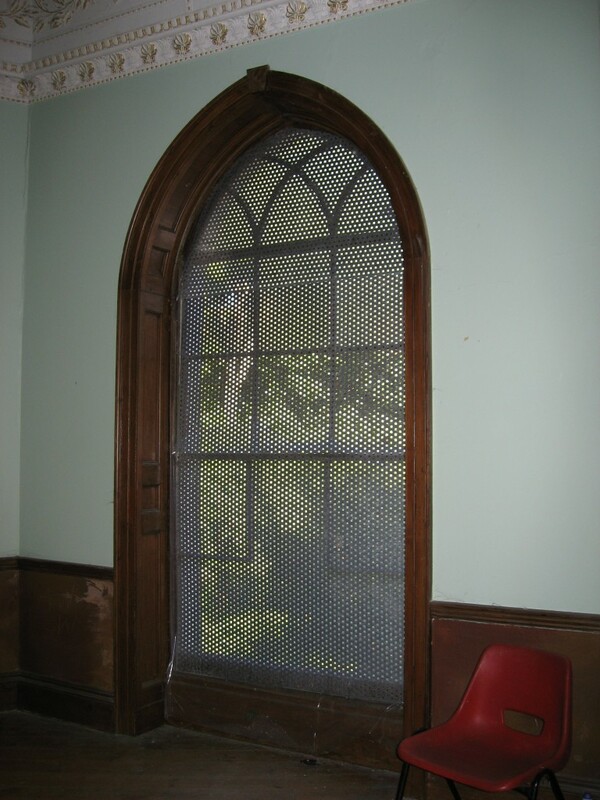 Steel reinforcement is to be in place on the inside face of the timber door for security reasons. It doesn’t sound like it will all be done in time for the Olympics, though the initial work may be, but at least the process of preserving the ruin and making it more accessible has started. Who was Major Robert John Little? 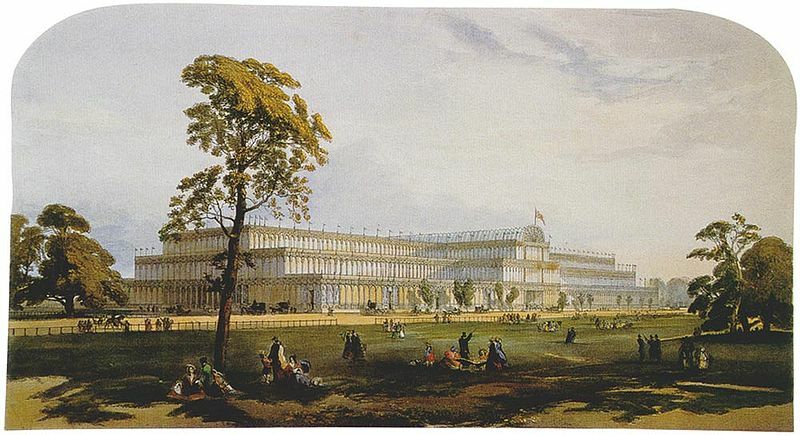 The restoration of parts of our urban environment prompted by the prospect of thousands of visitors is one of the positive side-effects of Greenwich being an Olympic borough. 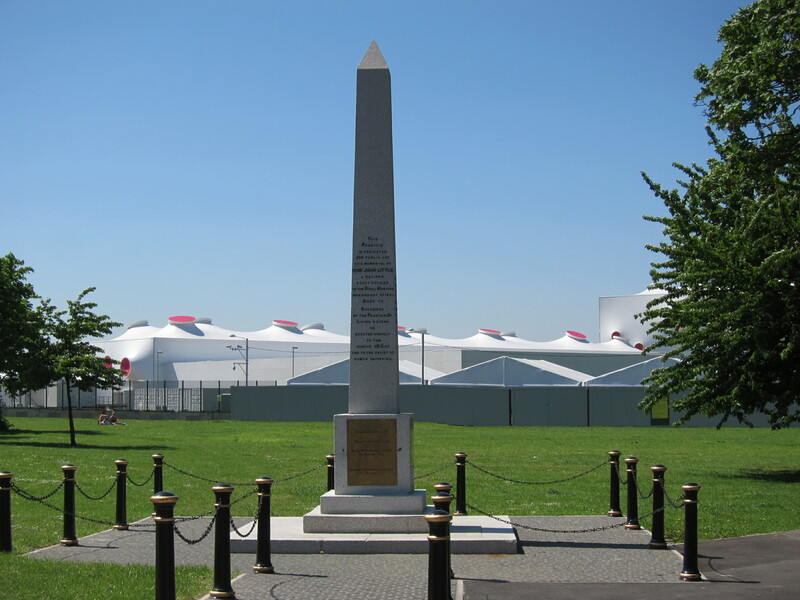 Major Robert John Little’s Memorial Obelisk was an obvious candidate for refurbishment; it is located right in front of the shooting/archery stadium on Woolwich Common, and on the recommended route from Woolwich Arsenal station to the Olympic events. Some might say that its location on the English Heritage “Buildings at Risk” list should have been reason enough to restore the memorial, but …. whatever, it has been restored. 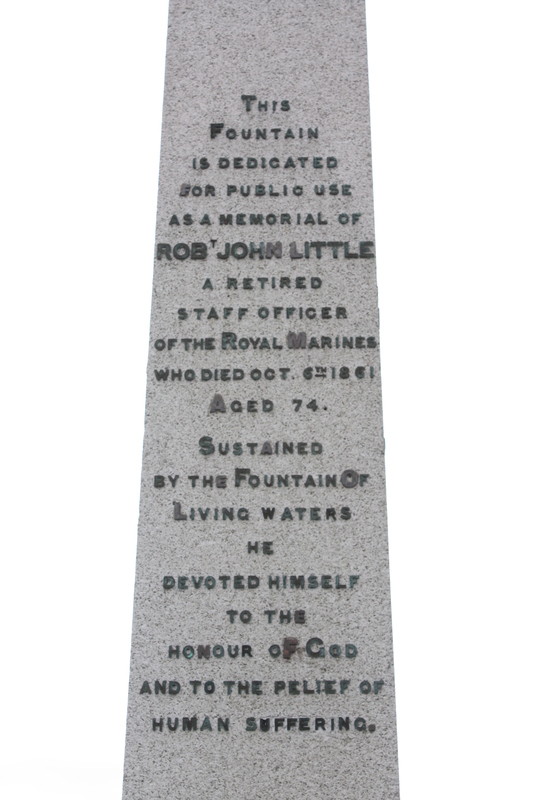 The description of the restoration of the memorial says that the new brass plaques installed on each face of the obelisk are “inscribed with details of Robert John Little’s Life.” However when I visited I found that apart from the front plaque they are all blank, so I thought I’d help out by finding out something about the life Major Robert John Little. Plus I was curious about who he was and why he had a memorial on the edge of Woolwich Common. After the formation of the Metropolitan Drinking Fountain Association in 1858, London was peppered with drinking fountains. This one, in the form of a grey-granite obelisk, was given by Anna Victoria Little, in memory of her late husband, Maj. Robert John Little, barrack-master at the Royal Marine Barracks and formerly a resident of Adelaide Place across the road. 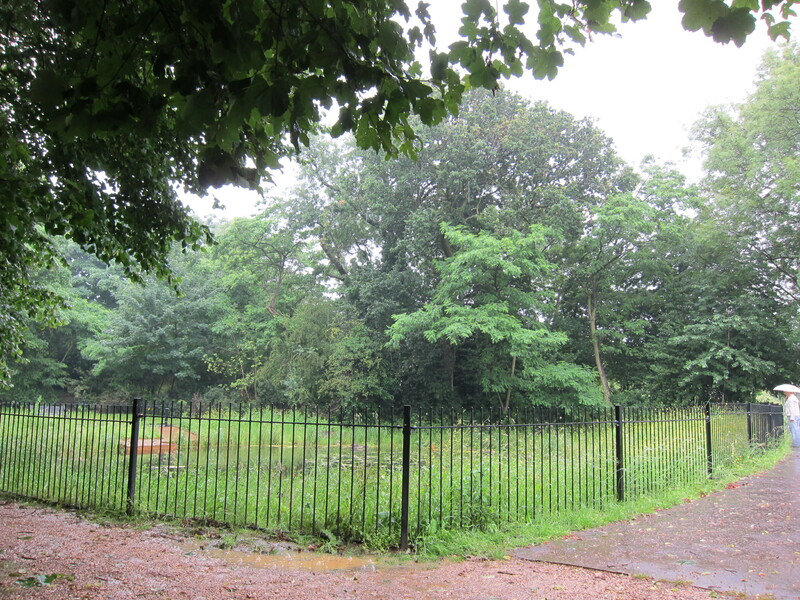 It was designed by a civil engineer, E. Gregory, and built by William Tongue, who, ironically, was responsible for enclosing part of Plumstead Common at this time. The obelisk survives, without its faucets, basins, twenty-one encircling cannon bollards or a trough for dogs, but restored with new bollards by Greenwich Council in 2011. Capt Little served in the channel fleet and at the blockade of Ferrol and Corunna in 1803-4. Appointed to the Royal Marine Artillery on the formation of that corps in 1804, and was employed in various bomb vessels on the enemy’s coast co-operating with the land forces, or on detached service. In command of the mortars in the Vesuvius bomb at the attack of Boulogne. Defence of Cadiz in 1809; and subsequently at the blockade of Rochfort, where he commanded a storming party in a successful night attack on the coast, on which occasion he received the particular thanks of the Admiralty, and was rewarded by the Patriotic Fund:- at the commencement of this attack he was severely wounded by a musket ball shattering the wrist which rendered amputation of the right hand necessary. On the night of the 27th of September, the boats of the 120-gun ship Caledonia and 74-gun ship Valiant, lying at anchor in Basque roads, were detached under lieutenant A. P. Hamilton to destroy three brigs lying under the protection of a battery at Pointe du Ché ; and as the enemy had a strong detachment of troops in the adjoining village of Angoulin, a party of 130 marines under captains Thomas Sherman and Archibald McLachlan, lieutenants John Coulter and John Couche, and lieutenant Robert John Little of the marine artillery, were added to the division of seamen from the squadron. At about 2 h. 30 m. a. m. on the 28th the marines were landed under the Pointe du Ché, and the alarm having been given by the brigs, an ineffectual fire was opened from the enemy’s guns. Lieutenant Little, with his detachment of artillery-men, pushed forward with the bayonet to the assault, supported by captain McLachlan’s division, and by a detachment under lieutenants Coulter and Couche; and having gallantly carried the battery, spiked the guns. Lieutenant Little, in leading his men, on entering the fort received the contents of the french sentry’s musket in his right hand as he was in the act of cutting him down, and the wrist was so much shattered as to render amputation necessary. Whilst the attack was making on the fort, captain Sherman, with his division, took post on the main road by the sea side, having his front to the village, and his right protected by a launch with an eighteen-pounder carronade. A party of the enemy succeeded, under cover of the night, in bringing a field-piece to bear with some effect, but the marines instantly charged, and captured the gun. Two of the brigs were brought off, and the third destroyed ; and the marines were now re-embarked, having sustained no greater loss than lieutenant Little and one private wounded. In the defence of the battery on Pointe du Ché, the enemy had 14 men killed. Lieutenant Little’s battle injury didn’t end his military career, and the Navy Lists indicate that he was promoted first to Captain and again to Major and that he was awarded the Silver Naval Medal with one clasp. He became Barrack Master on 12th September 1829 on a salary of £183 per annum. 476. LITTLE, Major ROBERT J., 4 Queen’s Terrace, Woolwich Common — Inventor. An improved watercock, with double plug, for connecting pipes without breaking joints, with sectional drawings of the same. Designed by the exhibitor, and manufactured by Frost, Noakes, and Vincent, 195 Brick Lane, Whitechapel. Was Major Little a one-hit-wonder with his watercock, or did he have a successful career as an inventor? I’d love to find out. Interestingly Major Little’s 1851 home in Queen’s Terrace was, according to the draft Survey of London, next to Adelaide Place where he also lived. By my reading of the 1866 OS map both of these addresses faced onto Woolwich Common, roughly between where Jackson Street and Engineer Close are now, just over the road from his memorial fountain. The citation on Major Little’s obelisk says that he “devoted himself to honour of God and to the relief of human suffering.” One way in which he would have achieved this was through his contribution to the Executive and Finance Committee of the Royal Patriotic Fund. The Fund was instigated by Queen Victoria’s 1854 appeal for public donations to assist the widows and orphans of military personnel who were killed in the Crimean War. The appeal was a huge success, collecting over a million pounds in its first six months, and was able to found two schools in Wandsworth as well as providing grants to military widows and orphans. The Patriotic Fund continued in one form or another until just a couple of years ago when it was merged with the Soldiers, Sailors, Airmen and Families Association (SSAFA) Forces Help charity. I suspect that Major Little was also involved in other charitable work for the Royal Marines Artillery – for two reasons. Firstly the Charity Commission website mentions a charity named “Major Robert John Little“. It gives hardly any details, other than it has been amalgamated with the Royal Marines Welfare Fund. 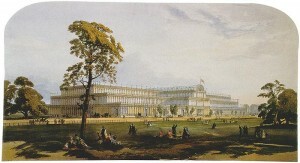 But secondly because, after his death in 1865, his widow, Mrs. Anna Victoria Little, donated the income from £100 to Royal Marine Artillery Benevolent Fund for the “distribution of bread and coals among the wives and families of corporals, gunners, and drummers in H.M. corps of Royal Marine Artillery resident at Portsmouth”. I wonder if Major Little was also associated with the Benevolent Fund. Another topic to keep an eye out for when visiting libraries! 164. LITTLE (26). Caroline, wife of Robert John LITTLE, of the Royal Marines, died January 12, 1832, aged 42 years. Richard Rosdew Little, late Captain of the Madras Horse Artillery and Commissary of Ordnance, there died August 23, 1861, aged 46 years. Robert John Little, died October 6, 1861, aged 74 years. He had served in the Corps of the Royal Marines nearly 55 years, joining the R.M.A. in early life and returning in 1837 as Major and Barrack Master of the Woolwich Division, which appointment he held for 28 years. Anna Victoria, relict of the above-named Major Little and daughter of Capt. Henry INMAN, R.N., and sometime Naval Commander at Madras, died March 5, 1866, aged 72 years. 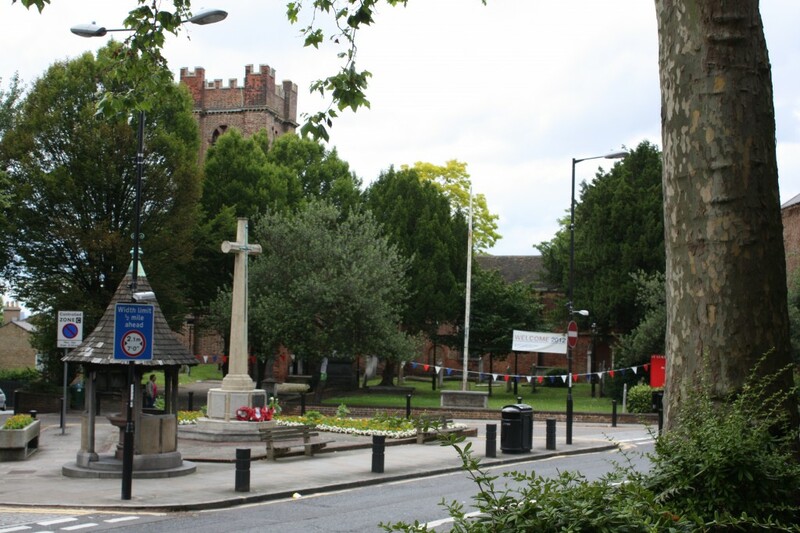 The plan of the churchyard indicates that Major Little’s family grave was just to the left of the church entrance; was, unfortunately, because it’s no longer there, just some remains of brick foundations showing where the grave used to be. Interesting that there is a difference in dates between the monument inscription and the Naval Lists for when Major Little became Barrack Master. So, still lots of unanswered questions about the Major, but hopefully there is now enough to fill the remaining three brass plaques on his memorial. 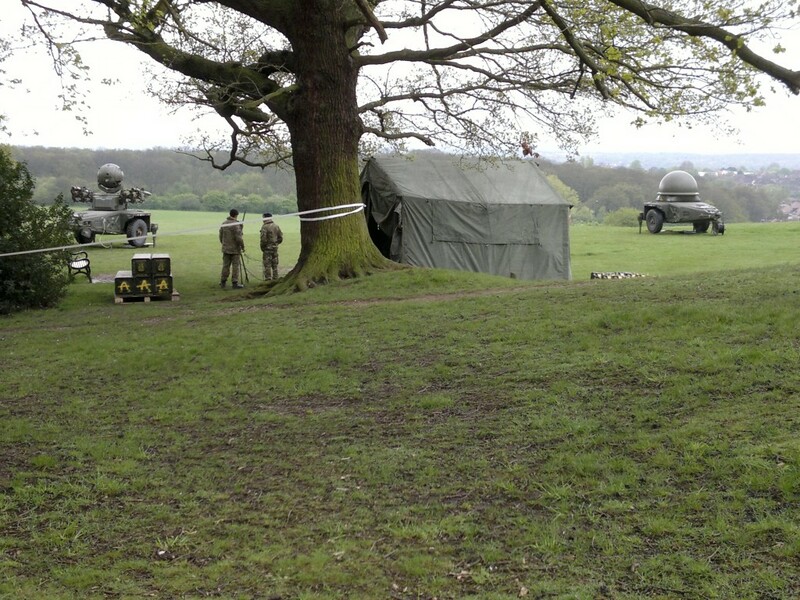 The Ministry of Defence has decided that a Ground Based Air Defence (GBAD) System will be deployed in Oxleas Meadows, on Blackheath and 4 other sites across East London during this summer’s Olympics. The MoD announcement said that the Rapier missiles will be in put place in the middle of July. The announcement was made despite opposition from people living near the missile sites, including a protest march from Oxleas Wood to Blackheath and the ongoing legal action by the residents of Fred Wigg Tower in Leytonstone. This is due to be heard next Monday, July 9th, at the Royal Courts of Justice. It seems that even the power of the Corky Fruited Water Dropwort was not enough to stop the missiles. 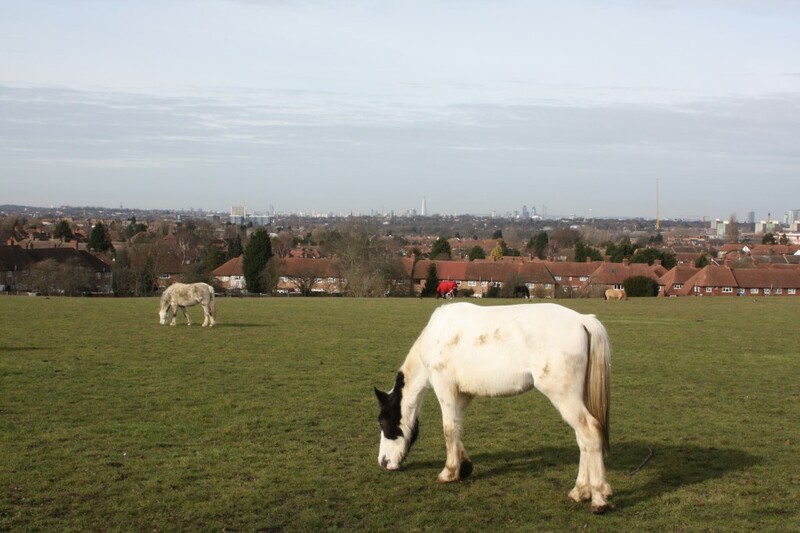 A barn dance in aid of the Severndroog Castle Building Preservation Trust will be held on Saturday 7th July 2012 in the barn at Woodlands Farm. 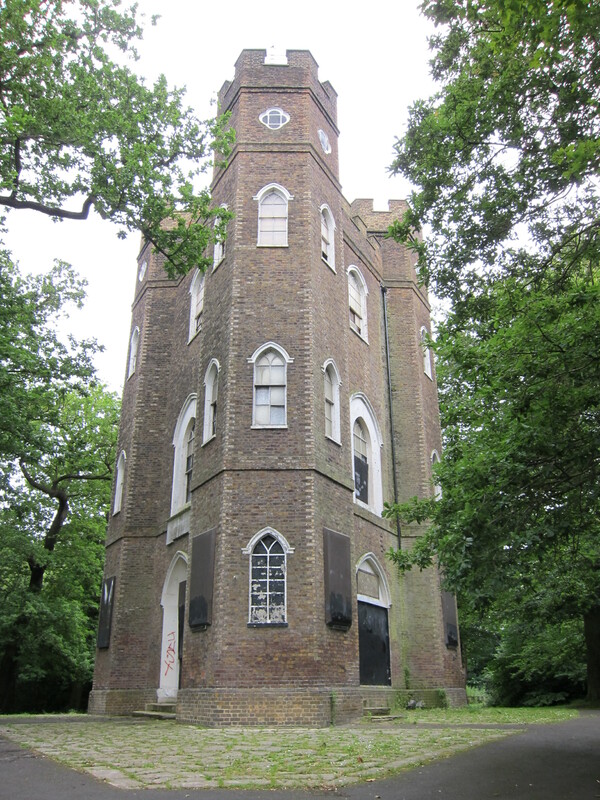 Tickets are £10.00, obtainable through the Woodlands Farm Office on 020 8319 8900 or via the trust at info@severndroogcastle.org.uk . The band for the dance is the very entertaining Skinners Rats, who have performed at other Woodlands Farm events, so it should be a lively affair. Bring your own food and drink.